This competition has now closed. Click here to find out who won. In just under a month, readers around the country will be taking part in the annual Independent Bookshop Week and I want to encourage you to head out to a bookshop and join in the fun. Thanks to the lovely people at Books are my bag I have a massive pile of books (the really very good shortlist for the IBW2016 book award) to give away and to get your hands on a bundle of them all you have to do is buy a book. That's right, just one book. I recently asked all internet bookshoppers to buy every fourth book from a real-world, independent bookshop and so for this competition you buy one book for the chance to win at least three books. I say at least three books, because I don't intend to keep any of these books: if only three people enter I'll be able to send the winners of each category a lot more books. Send the picture to bookshopblogger@gmail.com with the subject "IBW competition", along with your name and address, the name and address of the bookshop you visited and the date of the visit. Please include one sentence about your experience as proof of the visit. ** Also list your preference of winning from the adult, children's or picture book shortlist (or one from each). If under 18, please include your age and the name and contact of a parent or guardian. The competition runs from now until midnight on Sunday, 26th June, after the end of Independent Bookshop Week, giving you time to travel if there isn't an independent bookshop nearby. There is no limit to the number of times one person can enter, but each entry must include the purchase of a different book and be sent in an individual email. Entries permitting, there will be at least one winner per category, with a minimum of three books as a prize. The intention is to draw winners out of a hat, but as I'm the judge there's a chance I may allow inventiveness of photos to influence my decision. A Spool of Blue Thread, Anne Tyler; A God in Ruins, Kate Atkinson; The Shepherd's Life: A Tale of the Lake District, James Rebanks; The Green Road, Anne Enright; SPQR: A History of Ancient Rome, Mary Beard; The Road to Little Dribbling, Bill Bryson; The Man Who Made Things Out of Trees, Robert Penn; The Invention of Nature: The Adventures of Alexander von Humboldt, the Lost Hero of Science, Andrea Wulf; The Loney, Andrew Michael Hurley; A Place Called Winter, Patrick Gale. Goth Girl and the Wuthering Fright, Chris Riddell; How to Fight a Dragon's Fury, Cressida Cowell; The Rest of Us Just Live Here, Patrick Ness; The Astounding Broccoli Boy, Frank Cottrell Boyce; Pugs of the Frozen North, Philip Reeve and Sarah McIntyre; My Brother is a Superhero, David Solomons; The Boy Who Sailed the Ocean in an Armchair, Lara Williamson; Kensuke's Kingdom, Michael Morpurgo; Whistling in the Dark, Shirley Hughes; One, Sarah Crossan; The Person Controller, David Baddiel; Time Travelling with a Hamster, Ross Welford. What the Ladybird Heard Next, Julia Donaldson & Lydia Monks; GRRRRR! 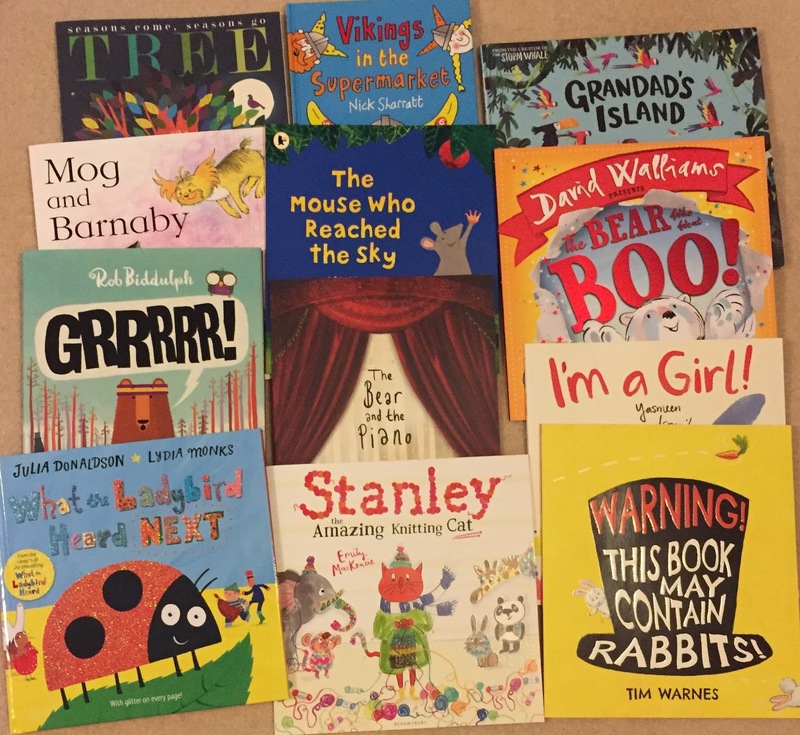 Rob Biddulph; Mog and Barnaby, Judith Kerr; Tree, Patricia Hegarty and Britta Teckentrup; Stanley the Amazing Knitting Cat, Emily MacKenzie; The Bear Who Went Boo, David Walliams & Tony Ross; The Mouse who Reached the Sky, Petr Horacek; Vikings in the Supermarket, Nick Sharratt; Warning! 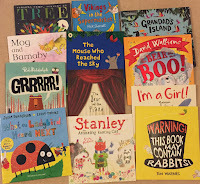 This Book May Contain Rabbits, Tim Warnes; I'm a Girl, Yasmeen Ismail; The Bear and the Piano, David Litchfield; Grandad's Island, Benji Davies. * Ask your friendly bookseller to help. If you're camera-shy, you're welcome to be hiding behind the book, but for proof of purchase I do need to see you and the book inside the bookshop. ** If writing fills you with horror, a photo of the receipt as proof of purchase will do (the receipt photo will not be published).